If the stillness instilled in a landscape suggests a sense of permanence, then it's an impression subtly strengthened by the presence of the sea. As scattered children play on the wide expanse of sand at Whitley Bay, a scrap of wrapper flits raggedly by, and the sea stretches out, blue-grey towards the distant sun. This sea, of course, is cliché – its apparent immortality so starkly in contrast to England's peeling seaside towns – but, in the movement of the waves, something more complex becomes apparent. 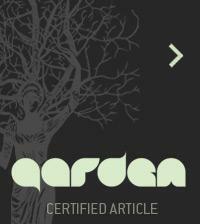 Nature is not divinely omniscient: it's mediated, appropriated, subjugated, and, we now know, surprisingly vulnerable. This is the territory explored by contemporary artist Kelly Richardson. 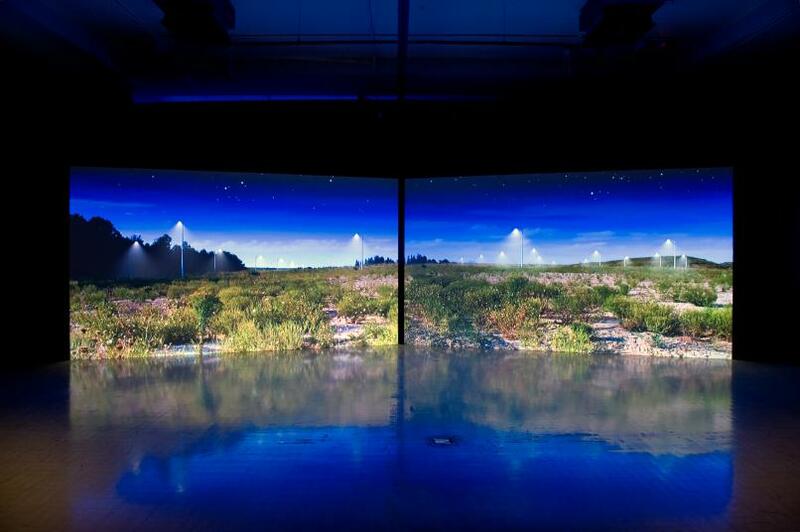 Across three exhibitions taking place simultaneously throughout the North East of England, Richardson's video works are allotted the necessary time and space in which to operate. 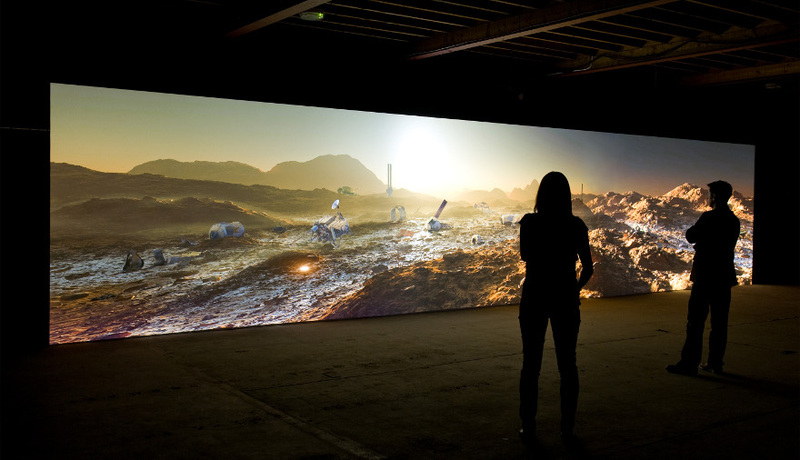 There's a new print entitled Orion Tide at the National Glass Centre in Sunderland, a colossal video installation just down the road from where the artist lives in Whitley Bay, and a sweeping mid-career survey show at the Northern Gallery for Contemporary Art (NGCA) in Gateshead. This last is perhaps the best entry point for an internationally acclaimed artist whose work has been relatively under-appreciated in the UK. Surprisingly, Legion is the first time that Richardson has been able to show multiple works in the same gallery, and the resulting show deftly charts a clear career progression. Like one of her own films, the show takes us in a loop, from recent, large-scale, multi-screen installations, back to earlier works – smaller in scope – and round again to a troubled now. Short, looped works from 2005-6 establish an uneasy relationship with cinema's established tropes: the camping trip, the lone car in a desert, the suburban Gothic. Richardson's childhood home spins on its axis in a bland Canadian suburb; a mosquito net forms a kind of second screen, smearing the sky to violet, orange and cyan; the sound of crackling popcorn encapsulates the discrepancy between cinema foyer and the 'great outdoors'. And yet. Perhaps the popcorn here is not so much encapsulating the discrepancy as eliding the boundaries. Nature, notes the NGCA wall text, is “always already mediated”; always already in quotation marks. The camping trip is arguably no more authentic than the multiplex. 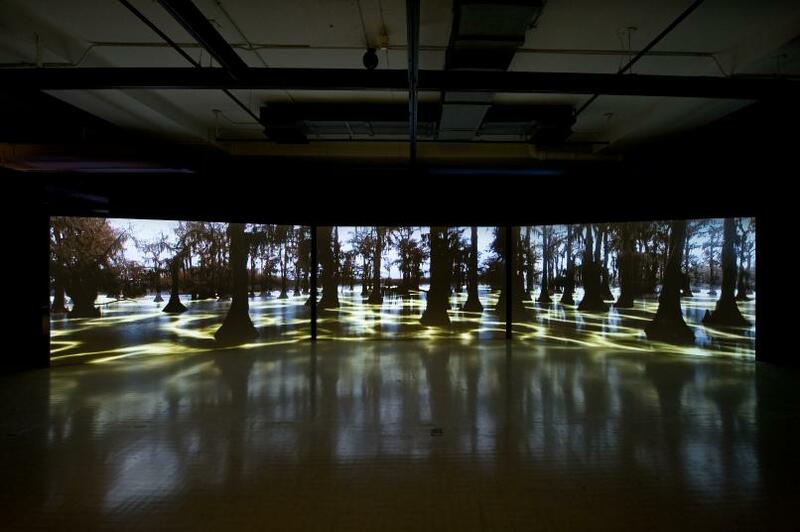 This questioning of authenticity asserts itself through a kind of tricksiness: Leviathan (2011), for example, with its Biblical title, is suggestive of some kind of apocalyptic flood, but is actually of bald cypress trees in Texas. Similarly, in Exiles of the Shattered Star (2006), a Lake District idyll is dominated by falling, flaming meteorites, but they're only overlaid in post-production – they never land, only glide out of view. 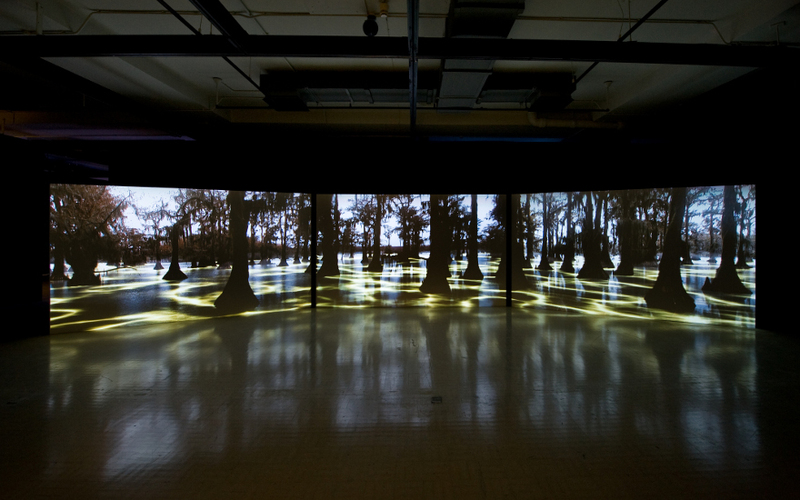 And in the Great Destroyer (2007-2012) receiving its world première in the NGCA's project space, eight screens of vividly lit forest are periodically interrupted by screeches of urban noise – a car alarm or a chainsaw. Then you read that they're actually caused by the male lyrebird, one of nature's most astounding mimics. What then is natural? As Richardson's works have become slower, they've also become exponentially larger. At the heart of these later works is a tension between stillness and movement. Perhaps it's a facet of film in general; perhaps it's analogous to the difficult balance between conservation and progression that troubles so much ethical thinking around the environment. 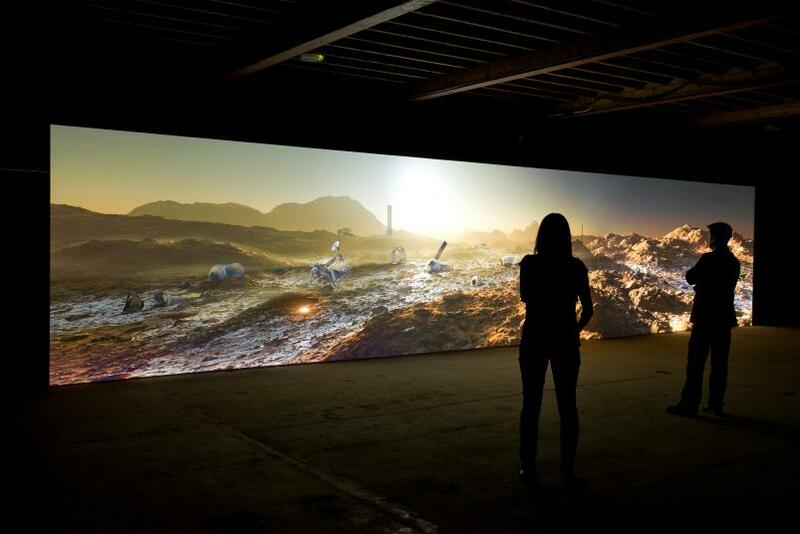 Either way, Mariner 9 – commissioned by Tyneside Cinema with backing from Arts Council England – represents the culmination of this expansion in scope and scale. 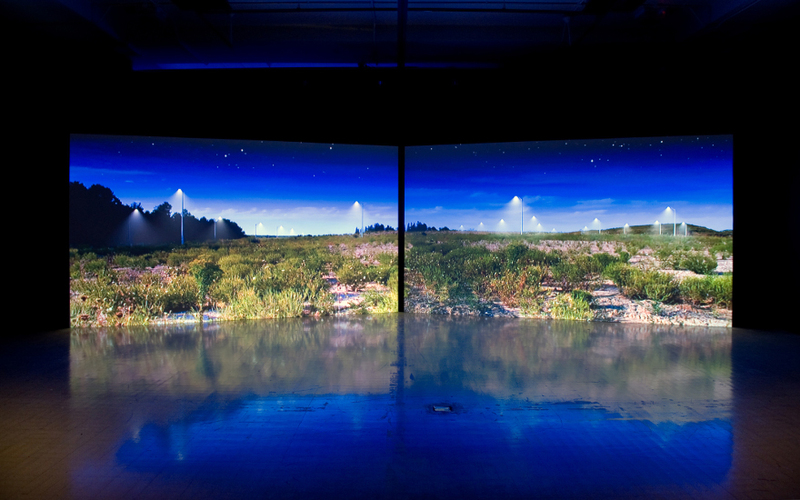 The work consists of a twelve metre-long video installation, as monumental in scale as Tacita Dean's Film that filled the Turbine Hall at Tate Modern in 2011. Unlike the analogue editing of Dean however, Richardson embraces the new: specifically, imagery and technical data borrowed from NASA and put together with a cutting-edge scenery generation software programme called Terragen. Both artists' creative processes are slow and laborious. For two weeks in August, Mariner 9 took over the once-fine Spanish City Dome of Whitley Bay. Outside, the carpark is boarded up, empty. Inside, the vast film's stillness is punctuated by periodic gusts of ice-bleached wind, by pulsing lights and by the rhythm of struggling mechanisms. Pipes and wires, towers of obsolete technology: the detritus of progress spill out across a sun-scorched chiaroscuro of land and shadow. We stand on crumbling concrete, breath in an old, dark, salty whiff. At Whitley Bay, the sea gets in everywhere. Likewise, the HD sublime of Richardson's films – slow, grand, undulating, witty – creeps forth, pauses, and lingers onwards like a moment.